"Everyone here dies. It's the only mercy I can offer." 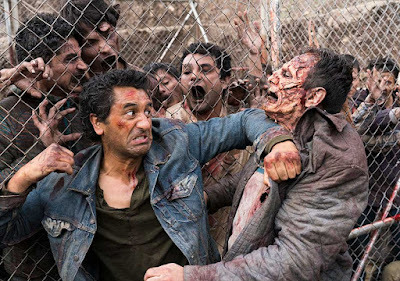 I've been trying not to constantly compare Fear the Walking Dead to its parent show, but this episode kept reminding me of Terminus. Travis Manawa, a character who has most certainly just turned an emotional corner, could have been Rick Grimes in this situation: stoic, single-minded, dangerous. Losing his son Chris has made Travis into a much tougher person, a guy who clearly doesn't give a crap any more, although he does still see Alicia and Nick and his responsibility. I particularly liked how Travis included Luciana, a woman he has never met, as part of his family — simply because Nick said she was with him. It seemed obvious that the "Depot" was a military base populated by soldiers who had gone wrong, but no. It was all about cute young Troy Otto, who seems to be auditioning for psychopath of the year, killing people after taking their height and weight and writing numbers on their foreheads, and then guessing how long it would take them to turn. Medical experimentation and execution in the showers. How very Third Reich of him. Travis watched the murders happening right in front of his eyes and didn't so much as flinch or change expression, while Nick was holding Luciana and shielding her from the sight. Later, Madison was trying to reconnect to Travis and he had trouble looking her directly in the eyes. He told her he was okay. Come on. He is not. Why separate out Madison and Alicia? Was it the obvious, that they were attractive American women? Clearly, Troy and his goons kept insisting on seeing Travis as Mexican and of course, Nick was with Luciana, who was injured. But then there was Steven, poor guy, an American who wasn't injured. Confusing. I'm sure it will make more sense later when we learn more about these new characters. Taking Madison and Alicia for helpless damsels in distress was a near fatal mistake, and I was so delighted that Madison got the drop on Troy with a freaking spoon. (Eye! Spoon! Wow.) Alicia acquitted herself well, too, hiding that butterfly knife that ended up saving Nick and Luciana in the sewer. Madison didn't even have to tell Alicia not to drink the tea. I thought Travis's gladiator fight with the rebar and concrete bricks was surprisingly awesome. 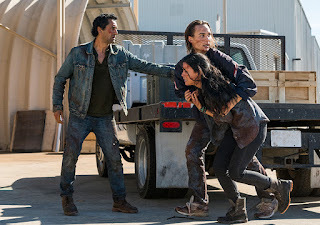 Interestingly, when Travis had to choose between helping Madison, who was surrounded by walkers, or getting Luciana to the helicopter, he chose the latter. I'm pretty sure that was more confidence in Madison's abilities than a preference for Luciana, though. So, new upcoming housing situation. Where will it fall on a scale between Hershel's farm and the magic Baha house? Probably the latter, if Troy is living there, too. It's nice that Troy's brother Jake appears to be sane, though. And at least the Clarks are back together; loved the three-way hug. I doubt that Nick will walk off and leave his mother and sister alone again. When they were initially separated at the beginning of the episode, Travis said, "I'll find you, Maddie." In last fall's premiere episode of The Walking Dead, Glenn's last words were "Maggie, I'll find you." Was this foreshadowing? Are we going to lose Travis? I haven't seen the second episode yet and I don't read spoilers, but wow, "I'll find you, Maddie" gave me a little bit of a shudder. -- Lorenzo James Henrie (the late and unfortunate Chris) is out of the cast, and Danay Garcia (Luciana), Daniel Sharman (Troy) and Sam Underwood (Jake) have been added. Colman Domingo (Strand) and Mercedes Mason (Ofelia) are still in the cast, even though we didn't see them in this episode. -- I was impressed with those walking silhouette shots at the symbolic fork in the road in the opener that they repeated near the end. It made our people look a bit like cartoon characters, didn't it? -- How lovely the way Nick cared for Luciana and refused to leave her. He's growing up. -- We just learned that walkers lose interest in eating bodies when the blood becomes cold. That made sense of the way the "Depot" used dead bodies. So far, we've mostly had walkers used in "moats," not the actual inanimate dead bodies. -- Do they still have the Governor's eyepatch in Wardrobe? They could give it to Troy, since Carl isn't using it. -- Troy keeps a journal. Maybe it's his very own junior version of Mein Kampf. -- Many many rats! Hole in the wall. Face! Again, geez. Instant karma for that young killer, big time. Really good. Three out of four spoons. Or maybe it should be rats? The two episodes that aired Sunday night felt like different beasts, so I reviewed them separately. I didn't like this episode. It felt like they had an idea for the story and then scrapped it. It just didn't sit right with me that you could have this unbelievable douche (cold-blooded murdering douche!) and then have his brother magically appear and be a good guy and talk everyone down. Cheated, is the word I'm looking for. I felt cheated out of a good storyline. Also, what happened to the entire village that migrated in the season-finale? Were they all killed? The pit felt like the *spoiler alert* "pit" in the parent show and I don't know why they went there. I read your review twice and I just made the connection between Troy and the title of the episode, "Eye of the Beholder." Ewww. What is it with the producers/writers and the fascination with eye damage? The Governor, Carl, Troy . . Troy has evidently spent a lot of time watching the infected turn. He looked in the eye of the dead man about to turn like he knew exactly when it was going to happen. And the "moat" of dead bodies around the Depot - those were either previous "experiments" or Troy's people killed them just to create the buffer zone. The infected would need to have been shot in the head to be dead and not turn, or freshly turned then freshly killed zombies. Troy places no value on human life. Yeah, I think that the rest of the group from Luciana's village were killed or ran away in the massacre. 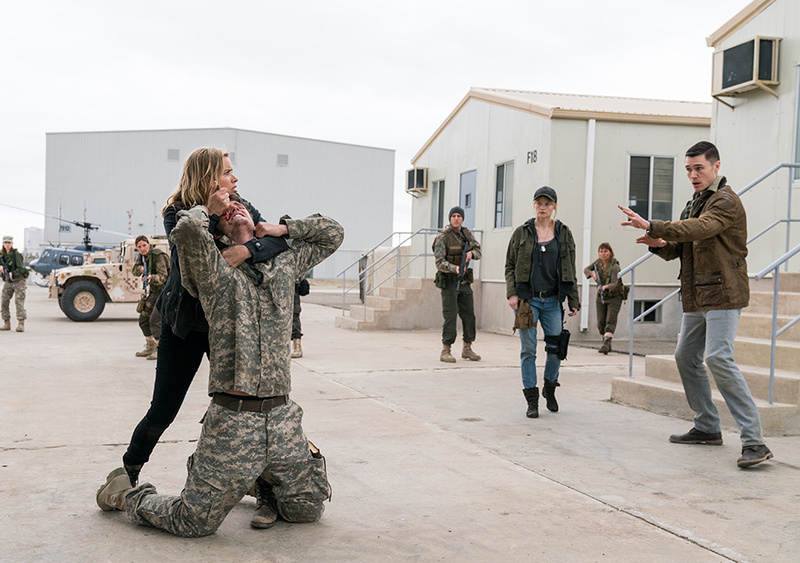 Which would beg the question, why did the attackers allow Nick and Luciana to survive? So that was Daniel Sharman, my mind kept denying it while I watched because of his american accent and evilness completely unlike what I remembered of him from the Originals. Yeah it felt stange that there were normal people in the group with total psychos. At least most of the psychos died by the end. At least the father sounds sane that he wanted to get rid of the evil son.